David Bowie's grabbing the cover of Heroes for this surprisingly great album – using the old cover art, then marking it over – in ways that definitely give a hint at the sound underneath! 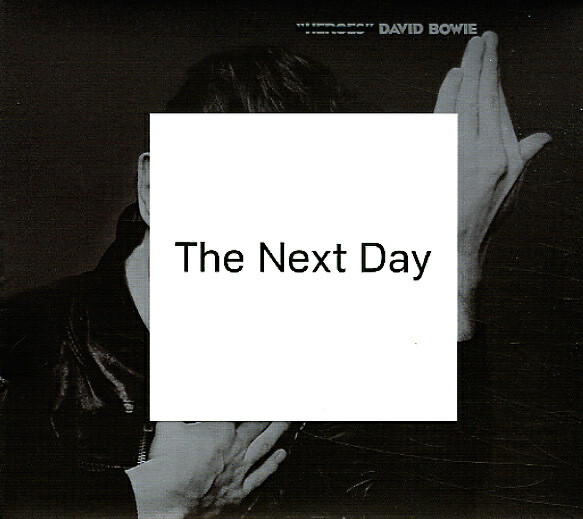 The style's darker and edgier than we've heard Bowie in years – kind of in "Joe The Lion" territory at times – given the fuzzy use of guitar, and raspy touches on the vocals and other instrumentation – almost as if the whole thing's got the same sort of back to basics approach that David found during his years in Berlin. Yet overall, there's more sweet moments too – some surprisingly warm tunes that, while not like contemporary pop hits, may well help remind the world that the Bowie star can still shine brightly in the right setting. Titles include "Dirty Boys", "The Next Day", "If You Can See Me", "Boss Of Me", "Dancing Out In Space", "Love Is Lost", and "Valentines Day". © 1996-2019, Dusty Groove, Inc.